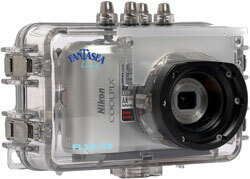 Fantasea has announced new underwater housing called Fantasea FL-19/20. The Fantasea FL-19/20 are designed for the Nikon Coolpix L19 and L20 digital cameras. They are depth rated to 60 meters/200 feet. The housing protects the camera from water, dust, sand and other elements that can damage the camera. You can access all functions on the camera with the housing and it even has a removable flash diffuser. The Fantasea FL-19/20 underwater housing is available now and costs about $280. Fantasea Line announces the release of a new housing specifically designed for the Nikon Coolpix L19 and L20 digital cameras. The FL-19/20 Housing, depth rated to 60 meters/200 feet, is fully functional providing photographers with access to all camera functions. Fantasea’s new compact housing design and improved construction ensures easy handling and accurate access to camera functions through the critical placement of push-button controls. The Fantasea FL-19/20 Housing has a double O-ring seal on all controls, anti-glare hood over LCD screen, removable flash diffuser and a 46mm threaded lens port. The FL-19/20 Housing is ideal for outdoor and underwater photographers’ needs. Underwater photographers can dive or snorkel and capture all the excitement of this fascinating world, while outdoor photographers also have the option of capturing the action of such activities as white water and paddle sports, sailing and boating, surfing, fishing, hunting, backpacking and camping. The FL-19/20 protects the Nikon Coolpix camera from water, sand, dust, and other damaging elements. As with all other Fantasea Camera Housings, in the event of accidental water leakage, the camera inside is insured*. This attractive additional protection is exclusive only to Fantasea Housings and provides the ultimate peace of mind for photographers, who want to be sure their cameras are adequately and safely protected during use in these rugged environments. *According to the terms and conditions of the Flood Insurance Program. Fantasea Line is an international company dedicated to developing, manufacturing and marketing of creative and affordable product solutions for the diving, underwater photography and water sports markets. Fantasea’s management has been involved in the diving, water sports and photographic industries for over 37 years. With offices and representatives worldwide, Fantasea cooperates with leading international manufacturers on joint venture projects for product development and distribution.